Crunchyroll - Murder on the Turnabout Express: The Ace Attorney Anime's New Original Case! 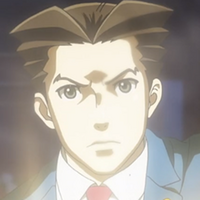 Murder on the Turnabout Express: The Ace Attorney Anime's New Original Case! The latest arc of the legal drama is a surprise even for fans of the game! Fans of the Ace Attorney game series are finally getting to see the action of the third game, Trials and Tribulations, unfold. 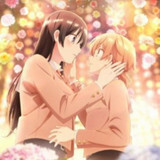 But before going back in time to see Phoenix and Mia's first meeting in the courtroom, the show took a surprising detour into a completely new story! "Northward, Turnabout Express" was written with the cooperation of Ace Attorney creator Shu Takumi, and features a new trial and a whole new cast of characters for Phoenix and Maya to contend with. This time, the pair have been invited to take a ride on the Silver Star steam train, unaware that their presence is needed for something far more pressing than a New Year's vacation. With Gumshoe, the ever-present bearded judge, and a prosecutor on hand, the Silver Star has become a moving courtroom—and the deadline for a verdict is the dawn of the new year. Fans will know this isn't the first anime-exclusive story. Last season's "Turnabout Promise" and this season's "Sound the Turnabout" give us a look back at the cast as children—from Phoenix, Edgeworth, and Larry strengthening their bonds of friendship to a look back at the youth of Edgeworth and Franziska. But "Northward, Turnabout Express" marks the show's first foray into an entirely new court case, complete with a full cast... and even a new prosecutor for Phoenix to add to his list of foes. 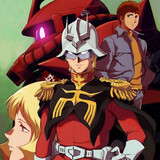 While Phoenix tends to take the side of the helpless and downtrodden, his defendant in this story holds all the cards: Avery Richman (yep, this story has its share of punny names), a naturalized Japanese citizen originally from the kingdom of Goldstruck. 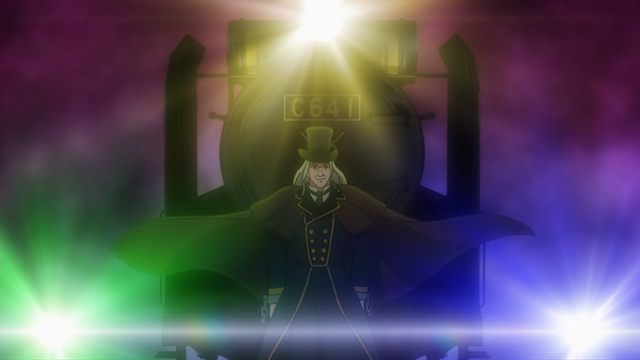 The train is his creation, and serves a very specific purpose. One year ago, he was found guilty of murder in an American court. He insists he's innocent, and wants a retrial to prove it. All the necessary witnesses are present, and the train is equipped to broadcast the events to "a certain location." No matter what happens, he'll accept the new verdict... provided it comes before the first morning of 2019. 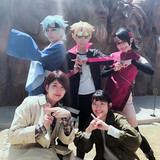 So why is Phoenix there? At this point, the defense lawyer has shed his "rookie" status, and his reputation precedes him. Richman only wants the best for his defense counsel, and he knows there's only one attorney assured of pulling out a crazy win. We also get to meet Tristan Turnbull, a Japanese prosecutor who made his way to America after graduating from law school. 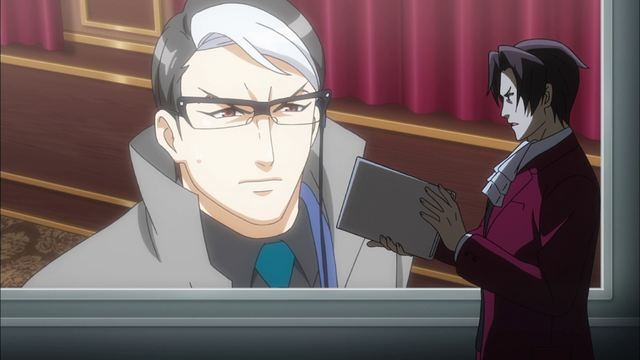 He has a tie not only to Richman's original trial, but also to Nick's old friend and rival Edgeworth. Turnbull seems to keep his cool no matter what, but is he a match for Phoenix Wright's unique style of lateral thinking? Turnbull and Richman aren't our only new characters, though. There's a host of colorful witnesses, including Mara Mytonbred and her granddaughter, Vega (whom you'll recognize by the ornamental croissant on her head). Train staff Rick Steam and Regina Locomoti take major roles as the trial progresses, as does the mysterious Gale Gaelic... though possibly not in the way you might expect. Of course, it wouldn't be Ace Attorney without some silliness amongst the more serious proceedings. Maya and Gumshoe are of the same mind when it comes to train journeys: it's time for adventure! The pair start out playing bomb squad on the luxurious train, but soon get separated when things start to unfold. Fortunately, they get all the excitement they wanted: a locked-room mystery, a teleporting corpse, and a fiery spirit are just a few of the strange occurrences they confront before the case is solved. So, what does it take to write a new Ace Attorney story and make it fit the feel of the original? 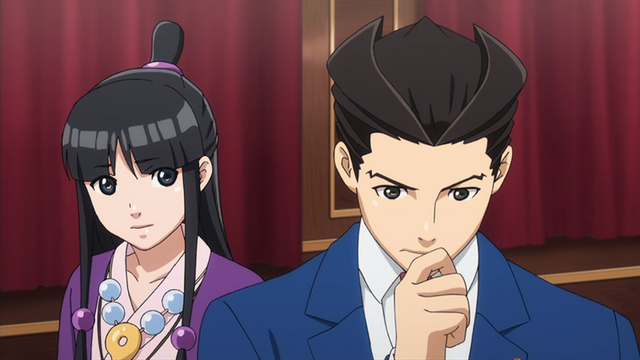 According to creator Shu Takumi, the most important parts of any case are the quality of the mystery itself and the turnabout that wins the day for Phoenix and his client. The mystery of "Northward, Turnabout Express" isn't confined solely to Richman's murder charge, expanding into stranger and more complex mysteries as the train rushes toward its destination. When all the pieces fit together, though, the turnabout is satisfying—and it's a major one, with implications spanning multiple continents and uncovering corruption in unexpected places. Lighthearted moments are also important, though—and don't worry, there are plenty of those. Additionally, this case does something that no other has ever done: it was created closer to real time than any of the series's other cases! We've finally arrived in the far-flung year of 2019, when much of Trials and Tribulations took place. In fact, the game's big finale kicks off literally next month. 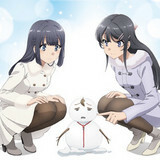 With "Northward, Turnabout Express" airing in December, it's possibly the first time a court case for the series has been written as taking place in its own present day, only weeks before rather than decades. So what happens to Avery Richman? Does Phoenix win the day? What's Edgeworth's relation to new prosecutor Tristan Turnbull? And will Maya and Gumshoe ever get to defuse a bomb? You can find out for yourself right now! 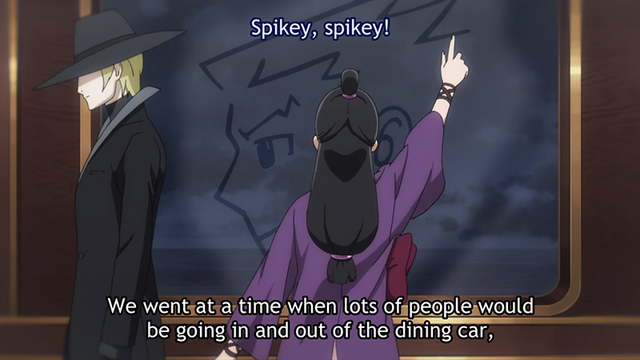 Watch "Northward, Turnabout Express" from Ace Attorney Season 2 right here on Crunchyroll. And do it soon... because tomorrow, the show carries on with a jump back in time to the anime adaptation of "Turnabout Beginnings"! Hold it!! Ace Attorney is Back, and We’ve Updated the Court Records!